The kitchen is one of the commonly used areas inside a house, maintaining its cleanliness and creating a safe environment for your home will make your kitchen more pleasant and will function effectively. Kitchen cabinets bring spacious compartments that enable homeowners to stock their goods, and at the same time style their kitchen based on what size, shape, and color of their cabinets. These are one of the essential fixtures that homeowners should occasionally update, it may seem expensive and out of the budget, but keeping it tidy and usable will save you up more and more cash, rather than spending relentlessly on what you should do with your kitchen. So, if your kitchen cabinets are already making your kitchen look old and worn, then perhaps it’s the perfect time to update their look. 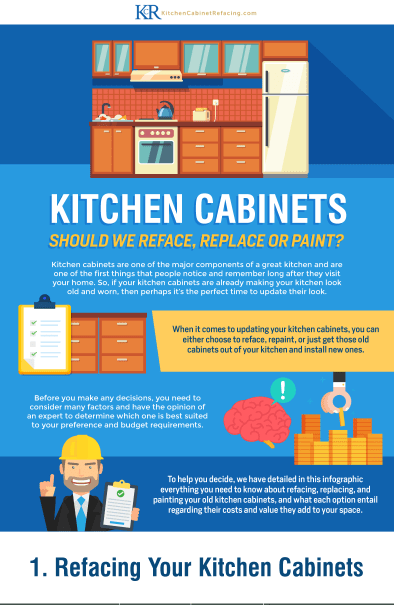 But the battling question is, when will you know when it’s time to reface, replace, and paint your kitchen cabinet?